This is the final post in my P&D series, where I will provide an overview of the Research Analysis and Writing the Dissertation stages. The approach used for the data analysis differs depending on the research strategy and data collection methods used, so here’s a quick summary of the method I followed for Grounded Theory Research using Interviews. As I alluded to in my previous post, one of the challenges I encountered was what to do with 15 interview recordings, each of around 30-45 minutes length – transcribing these was likely to take between 4 and 8 working days before I even started the analysis! However, reading the literature about Grounded Theory introduced me to the concept of coding: this involves taking the salient points from the interviews and assigning them to a ‘code’ which represents the essence of the statement. For example, the comment “a strategic alliance is where two organisations combine to produce a new product offering that does not exist today and brings value to both organisations” could be assigned the code “joint value-generating product offering”. The advantage of this two-pass approach was that the initial recording of comments helped me become familiar with the data, and allowed me to get a view of the trends appearing between interviews, so I could choose codes that were consistent across all the comments. The final stage of the analysis involved focusing on each of the individual research objectives separately, where I used an Excel PivotTable to summarise the codes assigned to each one. This was generally quite a long list (eg. 30-40 different codes), but reviewing all the codes together helped me to see trends or identify gaps in the level of detail. I was then able to return to the original data and re-code some of the statements (focused codes); this resulted in a more manageable list (eg. 10 different codes), which I could then compare across the different types of individuals interviewed. An additional benefit to this approach (in addition to consolidating 816 statements down to about 60 codes), was that it provided a quantitive data set to work with alongside the original qualitative comments. Although the sample size was not big enough to draw statistically valid conclusions, I was still able to draw numerical comparisons of the data. More importantly, this exercise took around 27 hours rather than the expected 50-60! Undoubtably the most daunting aspect of undertaking the P&D is writing the 15,000 word dissertation (or possibly longer with supervisor approval!). Although there is a typical structure for a dissertation, there is flexibility in how it is written. My advice would be to work closely with your supervisor to ensure it is structured in a way that suits them – not only because they have lots of experience in reviewing them, but also because they will be first marking your work. I had a really helpful supervisor who provided me with a pro-forma beforehand explaining what he typically likes to see in each section – by aligning my dissertation to this meant it would be presented in a way he expected, and ensured I did not miss any fundamental points. I was also in regular contact with him whilst writing my dissertation, not only to gain initial feedback on each chapter, but also to seek advice about topics such as the level of depth required for the literature review, and how to divide content between results, analysis and recommendations. Introduction – I wrote this chapter prior to starting my research, and although I found it necessary to change it over time, I would definitely recommend writing this chapter as you start your P&D; it forces you to think about why your research is important, ensures you capture sufficient background information on the subject of your research, and encourages you to think about how you will go about your research – all of which help bring the P&D to life very quickly. Literature Review – I’ve discussed the literature review in a previous post, but one of the biggest challenges I faced with this was how to avoid writing too much. Having a specific set of research objectives helped with this, as it provided focus to the review, and avoided me discussing the many interesting (but not relevant) findings on the topic in general. Research Methodology – This chapter was slightly easier to write than others, and like the introduction I would suggest writing this before undertaking the research, as what you learn whilst writing this section may change how you approach the research itself – as I mentioned previously, I originally planned to pursue a case study approach, but writing this section resulted in me changing to the grounded theory approach, which was far more suitable to my P&D objectives. Results – I encountered some challenges writing my Results chapter – the initial feedback by my supervisor highlighted that I had used this section to begin my analysis, with the consequence that I did not display my results effectively. This highlights the importance of getting your initial draft to your supervisor early, as I was able to work closely with him to understand how to split content between the Results and Analysis chapters. Following a number of discussions, I focused on using the Results chapter to compare the various statements and codes identified for each of the two sample groups I interviewed. I used a combination of text, tables and charts to make it easy for the reader to interpret (and also to keep my word count under control! ), which also helped highlight trends and patterns for discussion in the analysis chapter. Another minor challenge I encountered when writing the results was how to use references for comments made by interviewees, as all interviews were anonymous. I overcame this by using a code to classify different types of interviewees (eg. DH1..5 were department heads and SH1…5 were individuals working with strategic alliances). Analysis – The analysis section focused on evaluating the research findings against the literature review. This was a much more descriptive section than the Results chapter, and the section that required the most thought. It was really interesting to write this section, as bringing the literature review into context both helped explain some of the results I had seen, and also allowed me to identify some new theories: both specifically to the subject of my research, and also more generically to the field of strategic alliances itself. Recommendations – This section is essentially the outcome from your P&D; ie. after undertaking the research and analysis, this is what my recommendation is moving forward. Having spent four months looking into the subject matter and speaking with many colleagues about the topic, I started writing this section with a view on what my recommendations would be. However, by taking the time to justify these recommendations using my literature review and analysis, I felt that I could really stand by these recommendations as they were proven by my research, as well as identifying some new recommendations that I had not previously considered. Conclusion – There were three parts to my conclusion; firstly I stated a specific answer to the original research question. Although this may seem obvious, this is something that I didn’t naturally bring out in my first draft, and yet including it provided the dissertation with a strong point of closure. I also used this chapter to highlight some of the limitations of my research, suggest how it could be generalised to other subjects, and also propose potential ways of taking the research further. And that was it … 6 months later, 110 pages (including appendices and references) were submitted to Warwick Business School. Not only did this represent the completion of my P&D, but it also marked the completion of my MBA – pressing the ‘Submit’ button for the final time was a wonderful feeling! Since then I have had my dissertation marked, and my MBA has been officially confirmed by the University. Next step … graduation! My second year of the Warwick distance learning MBA is now finished! My last blog post was written when I was right in the middle of writing three 3,000 word assignments – this was the first time I had needed to write three concurrently (previous semesters included exams or had them staggered), so hitting the submit button for the third time was one very happy moment. Following on from lesson three, this module looked at strategy from a different perspective – instead of focussing on the market (ie. competing based on what customers want), the resource-based view looks at how organisations compete based on their core competences and assets; it was interesting to look at some organisations I know and see how they combine the two strategies. We then looked at some practical strategy concepts – hyper-competition and blue ocean thinking (the latter was also covered in Innovation & Creativity). The second half of the module focused on some specific strategy-related issues: expanding internationally, diversifying to a multi-business organisation, mergers and acquisitons, and strategic alliances. These were all very interesting topics, and although we had a full lesson on each, a number of them also have a dedicated elective that goes into a lot more detail. The final assignment for Strategic Advantage was based upon a case study of the BP Macondo incident (more commonly known as the Deepwater Horizon oil spill). I’ve had limited involvement in the oil and gas industry during my career, but watched the fallout from the incident on the news. The case itself was very insightful, including lots of depth around what happened and why (there’s a good overview from Forbes for anyone who’s interested). The basis of the assignment was to look at this incident from a number of perspectives – firstly, to assess whether it was BP’s fault or an ‘industry accident’, then consider how BP’s history, culture, politics and regulations affected the decisions leading up to the incident, and finally thinking about the long-term strategy for BP. Overall it was a really interesting assignment, allowing us to explore how issues of risk and uncertainty can affect an organisation, and how strategy can play a key role when dealing with them. There was also a specific lesson on market-entry timing – an area of particular interest to the module leader, Scott Dacko – which looked at the benefits and disadvantages of being a market leader, early follower, and late follower. This module followed a different approach to others for the TMAs: instead of using them primarily to reinforce the content from previous lessons, the Strategic Marketing TMAs were assessed preparation exercises for our final assignment (although they didn’t contribute to the grade). This approach worked really well, as it not only helped me review the lesson content, but also provided some insight into the environment for the final assignment, and meant that I already had lots of material ready for the ‘research’ phase. The final assignment itself required us to select a product that had been newly introduced to the market within the last two years, describe & critique the marketing strategy used, provide an opinion on whether we think it will be successful, and suggest improvements moving forward. I can’t share the product I used given that the assignments have not yet been marked, but it was very interesting to go beyond the visible marketing efforts and look in detail at how the product was positioned, how it fits into the company brand, and how it has been received by the market so far. I was 70% through this module when I last wrote about it; the next few lessons explored some specific concepts such as Open Innovation, which is the concept of working with other organisations on innovation rather than keeping everything ‘in-house’, and Design Thinking, which reflects on how the innovation process can be designed and embedded in an organisation, and how this can impact the output of the design process. The module ended by looking at how to effectively lead creative teams, and realise business value from innovation. We had previously completed a group assignment for this module worth 30% of the grade; the remainder was assessed through an individual assignment, the focus of which was to develop a strategy to promote innovation and creativity within my organisation. This was another very interesting assignment, especially as I was able to undertake some primary research to assess my organisation’s state of innovation. This was based on the Innovation Value Chain concept, which includes a questionnaire designed specifically for this purpose. One of the nice side benefits from this assignment was that it generated lots of discussion with my colleagues who had completed the questionnaire, about how innovative my organisation was. That’s it for this semester – I have now completed twelve out of the thirteen modules, leaving just one module (Corporate Finance) and a project to complete next year. However, before I start those I’m looking forward to enjoying a few weeks off over the Christmas break – I wish you all an enjoyable festive season, and will be back again in 2014. I’m pleased to say that after 5 1/2 hard months, I have finally reached the end of the first semester for my distance learning MBA. It has been a great (and challenging) experience so far, during which I have gained some fantastic insight into financial and management accounting, macro- and micro-economics, and the behaviours seen in organisations, groups, and individuals. Last Wednesday was the assessment for the Accounting module, which took the form of an open-book ’24-hour’ exam; the expectation is not that we spend 24 hours working on it, but instead allocate 6-8 hours during a 24-hour period (given that the course has participants in most timezones). In practice, many people (myself included) spent much longer than this, with the aim of producing the best piece of work possible in the timeframe. The assignment consisted of two parts; the first part accounted for 70% of the overall grade and required us to compare two organisations using the CORE framework (see here for an explanation), and the second required us to select two questions out of three and write a shorter report for each question. Moving on to the next module, on Saturday evening I submitted my Economics assignment. The assignment title was given to us at Warwick Week, but due to the intense learning schedule, I like most people focussed on this towards the end of the semester. This assignment also consisted of two parts; the first accounted for 25% of the grade and required us to assess the impact of a specific economic shock on an economy. As I had completed my first TMA on China, I thought it would be sensible to use the same country; this helped me significantly as I already knew the location of the right data sources and had an understanding of the key economic dynamics. The second part of the question required us to complete a micro-economic analysis of a chosen company. The company I selected was Marks and Spencer, as I have a lot of experience working with retail customers, and M&S had a diverse performance over the last 10 years (I’d like to thank my wife for the suggestion, it was a good recommendation!). It also helped as we used this company for our ratio analysis lesson in Accounting, so I could understand better the interaction between the two modules. The final module for this semester is Organisational Behaviour. Due to unforeseen circumstances the assessment for this module will now be completed over the next few months. Obviously this has changed our plans slightly, but I guess unplanned changes happen in academia as well as in business! I’m looking forward to getting the assignment completed though, before I start the second semester modules. That’s it for now, and time for me to have a few weeks off (and my family to actually see me for more than a couple of hours a day!). I have a few more blog posts planned before the second semester though, following which I will provide an overview of the modules we will start in July. Lack of coverage of some of the key concepts – This was not directly covered in my tutor feedback, but having reviewed the specimen answer I found that a credible essay could be produced without having to refer to topics that had not been discussed. However, this highlighted one of the discussion points around case studies and essays: is there an expectation that we will all arrive at an answer based in a specific area (eg. personality, power, decision-making), or is any answer acceptable if it is justified and backed up by theories. I have recently posted to the discussion forums to get clarity on this, and will post a comment below when I get an answer from the tutors. Applying the theories – The specimen answer gave some really good examples of how to relate the concepts back to theories in an appropriate manner, and provided the ‘light bulb moment’ for me that helped me understand how to incorporate these references in the flow of the essay. Some guidance for anyone attempting an essay for the first time, who has limited experience in linking analysis to documented theories – find a sample answer for a similar question, as this will help you understand how to approach the analysis and provide the linkage back to the theories. Selecting a specific recommendation – The feedback on my options, recommendation and plan of action, was that they were too “vague” and “not consistent”. On reflection of my original answer I can see this also, and the approach I used for the second TMA (described below) will help address this. I also posted to the discussion forums to find out how to deal with multiple recommendations. The guidance was that the recommendation could be flexible including multiple options, as long as it was justified. I think the expectation is that you should focus on one key approach, but also have a contingency plan in case that fails. Referencing – Although I didn’t discuss this in my previous blog post, some useful feedback from my tutor included the style of referencing; specifically the importance of separating primary vs. secondary references. This was also complemented by a useful thread on the discussion forums, which discussed the “balance between rigour and practicality”; essentially, it is preferable to get a reference from the primary source, but there is the recognition that in a part-time distance-learning MBA that might not be possible, and so secondary sources are acceptable as long as they are referenced as such. In summary, despite finding the first Organisational Behaviour TMA difficult, as a learning exercise it was invaluable. The tutor feedback, specimen answer, and discussion forum activity have all provided some very useful guidance for attempting the second TMA and final assignment. Prior to starting writing, I produced a bulleted outline of the key points for each of the different sections (problem identification, analysis, options, recommendation, plan of action). This helped give the essay a better ‘flow’, and allowed me to identify any gaps or flaws in the approach I had taken. In a previous blog post I discussed the options I considered for note-taking. However, I found that an approach recommended by a member of my study group, Simon Bristow, was far more effective. This approach was to produce a table with the headings: Topic, Author, Description, Location, and then populate this with each of the theories as I read the textbooks and lecture notes. Then, after writing the outline as above, I was able to look at each bullet point in turn, find theories relevant to the point I wanted to make, and insert the author/title/location in this outline. When dealing with a fictional case study it is usually straightforward to consider the obvious consequences of an interaction between individuals, or a proposed recommendation. However, it is very easy to miss some of the more subtle, or hidden consequences. To address this, I imagined the specific interaction/option taking place between different individuals/groups within my organisation, and looked not only at how they would immediately react, but thought through the discussions I would have with them the following day. Although time consuming (so I couldn’t do this with every interaction), it did highlight some interesting effects that I probably would not have identified if I was just focussed on the case study. This TMA has now been submitted, so the focus for me now is on completing the remaining lessons, submitting one last TMA (for Accounting), writing the final essays, and revising for the Accounting exam. With less than four weeks to go until the semester is finished, I am unlikely to be making any further blog posts until I have finished now, but will post a few updates to Twitter for anyone who’s interested. To anyone who’s also on the Warwick MBA … hope the assignments go well, and good luck in the exam! 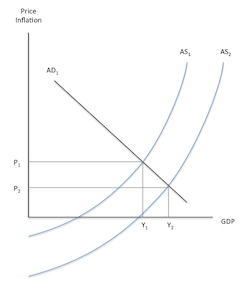 The first question considers the impact of changes on a generic economy, and uses the AD-AS model as a method to demonstrate this pictorially (see image, right). As I have a mathematical background I found these models relatively easy to interpret and produce, but it was the analysis behind these that I found particularly interesting, especially when some of the scenarios have been played out in the UK economy over the past few years. The second question required us to choose a specific country, research the economic history of that country over the past five years, draw conclusions about why it has experienced economic change, and provide some thoughts around factors that might affect its prosperity over the next few years. This was then to be related to the AD-AS model to show the impact of these changes in relation to GDP growth and price inflation. The country I selected for this question was China, for a number of reasons. Firstly, I visited Shanghai recently to meet with some customers and understand the market better, and found the culture and business environment very interesting. After returning to the UK I read a number of articles about the country, and these have strengthened that interest. And finally, whilst the UK and many other western economies are struggling to grow at this time, China is growing at 8% each year, so I thought it would be interesting to draw a comparison between the different economies. As this was the first real essay I had to write for my MBA (and the first one in over ten years), it took some time for me to determine the best way to approach the research and writing, but as soon as I had written the first paragraph, the rest of the essay was more straightforward. A great tool that I used for my research was Diigo (a social bookmarking and highlighting application) – I’ll write a post about this on a later date, but if you need to do lots of research on the Internet now, Diigo is worthwhile looking at. One aspect of writing an essay that was new to me is the concept of referencing. When at University completing my BSc, most of the essays were based around concepts taught during the lectures, so research was minimal at best. However, the MBA (as you would expect) requires that you perform your own research outside the provided textbooks and lecture notes, so referencing is essential to avoid breaking the plagiarism rules. The referencing system that Warwick Business School use is Harvard, which is relatively straightforward to use; the key point for me was remembering where I had read a statistic or quote that needed referencing (hence the need for Diigo). Now that my TMA has been submitted, I am looking forward to receiving the feedback from my tutor. As this is the first essay I have submitted I expect that there will be plenty of opportunities for improvement, but I would obviously prefer to hear these now as opposed to after submitting my final (graded) assignment. The next five days will now be spent concentrating on reading all the pre-requisite content for the residential ‘Warwick Week‘ which starts on Saturday – five days of intensive study, group work and networking, which I’m really looking forward to. My next blog post will be after Warwick Week, when I hope to share a summary of the week, and my experience of being a student again.